I need two words to describe the quality of some items - one word describing items of worse quality than the other. I read this question, Bad or Poor more severe. I'm uncertain if I fully agree with the answer about "bad" being worse than "poor", since poor people still can be good though... Being economically poor and criminally bad, is something different than being of poor quality and bad quality. I need two words to describe the quality of items - one being items of worse quality than the other - both being items of "bad" quality. I was thinking of using "low quality" and "poor quality" - but I guess "bad quality" may also be an option. The problem is that I'm uncertain if "low" or "poor" is the worse of them (I thought it low was higher quality than poor, but I may be wrong)... In any case, it's not obvious what's what. So, should I use "low" and "poor", "bad" and "poor", or "low" and "bad" ? What would be the ranging within the two ? Is there perhaps another better word to be used with "low" (or "bad") - or another set of words alltogether? You could easily differentiate between the two states by including the word "very" in one of them. So then you have a poor quality item and a very poor quality item, or a low quality item and a very low quality item. in a high degree; extremely; exceedingly: A giant is very tall. "Worse", and "worst" would suit your needs quite admirably, in my opinion, and they would work with either "bad" or "poor". So this widget is bad; that widget is worse, and the third one over there is worst. Most modern scales or grading systems take a quantitative, numeric approach. But we want a qualitative, descriptive, discursive scale. Something that uses words instead of numbers. So we'll need to find an industry that existed before our age of sterile numbers and soulless analytics, which used a qualitative, yet unambiguous, and fundamentally ordered way to compare the quality of products. 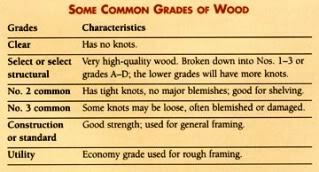 Unfortunately, it seems for most industries, such as beef, and lumber, and gemstones, and coins (numismatics) the scales begin at "decent", or at most, have a single grade for "bad" (probably because the products are intended for sale, and if an individual item is below par, commercially it makes more sense to simply discard it than to spend time grading it in detail). However, there is still one group who's unafraid to call a spade a spade (assuming a spade is somehow undesirable): teachers. The quality of A and B was indicated by the assessors on a linear scale. The terms of quality on the left side mean: excellent, good, fair, poor, bad. 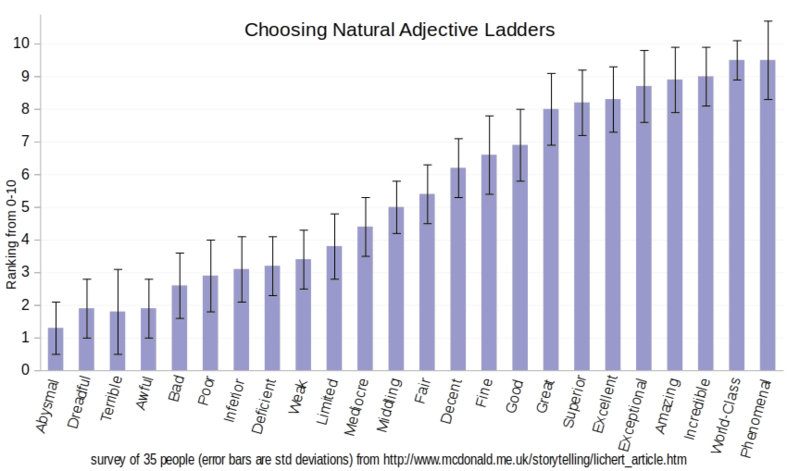 I was intrigued by the "adjective ladder" data in a writeup by Hicks et al. cited by a linked answer to a related question in the comments, but it's a bit data-starved and I wanted to see a graph with error bars to help me gauge similarity and variance. I've plotted it below. Since it is so data-starved (35 subjects is a very small sample in my opinion as a statistician), I used the provided standard deviations as error bars. This highlights the uncertainty and overlap; statistically, there is no difference between any two items with overlapping error bars. Comparing "awful" (1.9±0.9) to "limited" (3.8±1.0) isn't terribly informative since a value of 2.8 could fit into either. This shouldn't be as problematic if more than a few dozen people were surveyed (the standard deviations should shrink and the values should become more robust). To anybody looking to improve upon the cited research, I recommend at least a few hundred subjects. Ask them to rank each word relative to each other word (provide them a randomized list of these words and ask them to sort it) and to enter a value for each word using a 10 point scale with a precision of at least 0.1 (so "2" means "2.0" and users are allowed to enter "2.12345678" if they really want to). The ranking will allow comparing each pair of terms by each person (consider something like the Condorcet criterion, though that's more about finding a "winner" than the pairwise comparisons that it uses in the process). 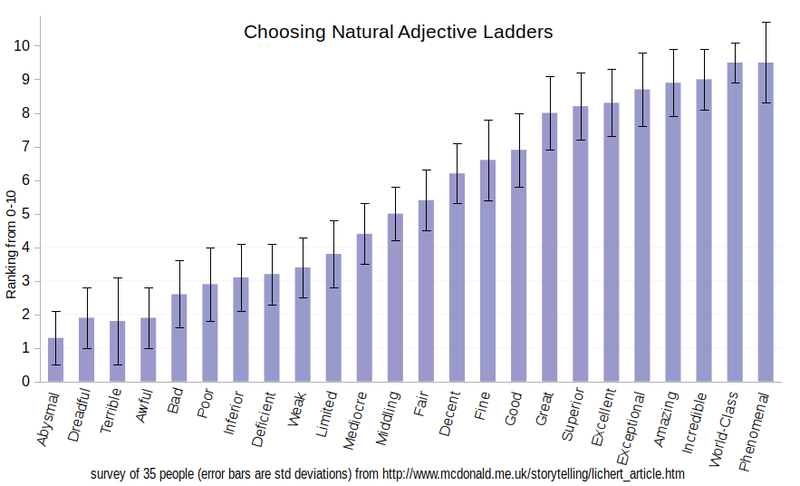 When choosing words, try to avoid the less popular ones (like "middling"). I'd like to see "dismal," "average," and "heroic" in there as well. If using something like Amazon Mechanical Turk, I suggest restricting participants to regions where English is the primary language rather than the lingua franca. Make sure you get good representation from each region so you can have per-region results in addition to the aggregate. "low" and "high" indicate a relative range, a level. Whereas "good" and "bad" are absolute. I agree with the other post that "bad" being worse than "poor". "poor" indicates it's not very good, where as "bad" is absolute - there isn't much beyond that. Each of these, when compared to another, should make it quite easy for anyone to understand the order that they naturally fall into. This should not only limit any confusion, but also avoid using the word very, which is a below average quality choice for a category title. “Bad” or “Poor” is more severe? Do you agree with these intermediate gradations between “frank” and “evasive”? What is the difference between “options” and “settings”? Are effect and affect related to efferent and afferent? What's the difference between “possibility” and “contingency”?